This is why Susan says ‘there was something solemn and binding in the bargain.’(83). Also note the ‘I do’ (12) on assent to the contract. Hardy explains that this happened all too often (26-7). This particular wife (and daughter) sale opens the novel with a moment of catastrophic rejection which, through guilt, leads inexorably to death. The harshness of the human act is contrasted by the horses ‘crossing their necks and rubbing each other lovingly’ (13). The swallow (9) symbolically enacts Henchard’s desire for freedom. He wishes to be unencumbered by the female principle (one might well ask whether sons were sold with their mothers). Henchard’s misogyny is both enabling and disabling. The Skimmity Ride was undertaken ‘when a man’s wife is – well, not too particularly his own.’ (260/300) i.e. when a woman is at odds with the values of a patriarchal society. It takes the form of a dramatic spectacle and therefore parodies processions of state, civic ceremonies and, specifically, the Royal Visit. It is a discourse from the oral tradition and is a judgmental folk ‘court’ giving public exposure which cannot be effaced. It is that part of the law that still belongs to the community and is theirs to enforce. It is also a temporary release from the established order – a permissible rupture of hegemony. ‘Rough music’ was directed at those who deviated from the male-determined norms of behaviour. With reference to the oral tradition of folklore, the battle between the old and the new takes place in the rite of the Seasonal King: this rite includes sacrifice as an essential element. This is played out in the course of the novel where the old ways are replaced by the new. In ‘The Mayor of Casterbridge, rivalry, love and physical confrontation are portrayed in the mundane business setting of corn merchandising. The oral culture, however, itself created outsize, heroic folk heroes – the human individuality of Henchard fights against a simple pattern of behaviour in a bourgeois, post-industrialised, culture. In a pre-literate communal world – i.e. the oral mode – ‘the bizarre was common place and daily life suffused with the extraordinary’ (David Vincent). In the manner of the extraordinary, we see the white wizard, Conjuror Fall who can be viewed in light of Conjuror Trendle in Hardy’s ‘The Withered Arm’. Henchard, a hero of the oral tradition (87), is ‘a rule o’ thumb sort of man’ (55) who used to ‘measure his ricks by stretching with his arms’ (122). His ineptitude with seals leads to his perusal of Susan’s letter and, in another incident, to Jopp’s opportunity. He suffers the greatest of blows when he even becomes inarticulate in the final interview with Elizabeth-Jane. Elizabeth-Jane, herself, states that ‘the romance of the sower is gone for good.’ (167/194) The novel partly traces the continued loss of the traditional ways on the arrival of mechanical inventions such as the seed machine. Henchard sits uneasily in the new literate world: we first see him he is ‘reading or pretending to read.’(2). It is not surprising that his response to a world changing from that of Conjurer Fall to one of paperwork, is confused on both of those counts. Henchard’s will, decreeing that ‘no man remember me’, because it is in written form, is Hardy finally consigning the oral tradition to oblivion. Hardy would perhaps have concurred that ‘Animism spiritualised the object, whereas industrialisation objectifies the spirit of men.’ (Adorno and Horkheimer 1979). At the end of the novel, there is a doom-laden sense that Abe Whittle’s elegy marks the passing of the rural picturesqueness of the oral community. Elizabeth-Jane (and perhaps Hardy, at this stage in his writing) still holds, however, to ‘the persistence of the unforeseen’ which suggests that present circumstances do not determine the future. Hardy regretted the loss of relation with the land even though working on it involved appalling hardship. He wrote that although ‘in their future there are only the workhouse and the grave.. .a pure atmosphere and a pastoral environment are a very appreciable portion of the sustenance which leads to produce the sound mind and body.., the labourer’s birthright’. The natural rural economy of ‘using’ is replaced by ‘exchange value’ and capitalism. Hardy’s fiction concerns those who seek social advancement but who may be undermined at any time. Henchard is a rural proletarian seeking to sell his labour – he becomes a capitalist. Both Farfrae and Henchard show that, no matter how humble, a man could climb the ladder of entrepreneurial society. The self-made man became a popular Victorian myth: Henchard represents the primitive form and Farfrae the new ‘professional man’ – both are devoted to the doctrine of hard work. 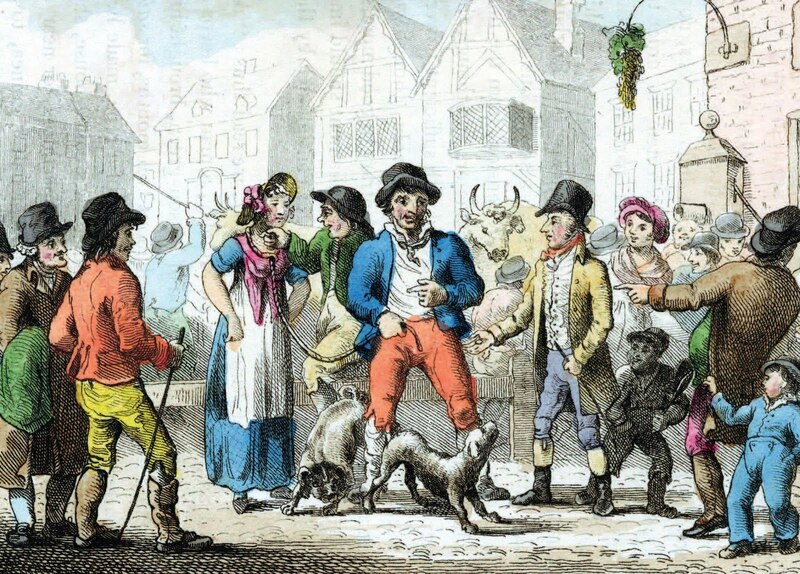 In the text, the decline of the rural economy is noted, for instance in pages 21 & 24; in the ‘agricultural and pastoral character’ 32; Casterbridge is referred to as the ‘pole, focus, or nerve-knot’ 70; consider the Carrefour l74; note the ‘old shepherd surplus to economic prosperity 184; ‘romances of the sower’ disappears 194; and the under-class of Mixen Lane has a corrosive influence 293-6. A way of life is also shown in the objects for sale – these memorialise it for the modern reader (32/32). Durnover particularly shows the link (194) and note Hardy’s ironic comment that the community had a ‘primitive habit of helping one another in time of need’. This may be contrasted with the self-interest of the competitive world based upon market forces. The Fair and its decline is an ironic commentary on Henchard’s own career and upon the wider changes in the agricultural community: when Susan returns, the tie-ropes were half as long: when Henchard returns, it has fallen into desuetude. The Poor Laws and The Enclosure Acts legalised the enclosing of previously common land.